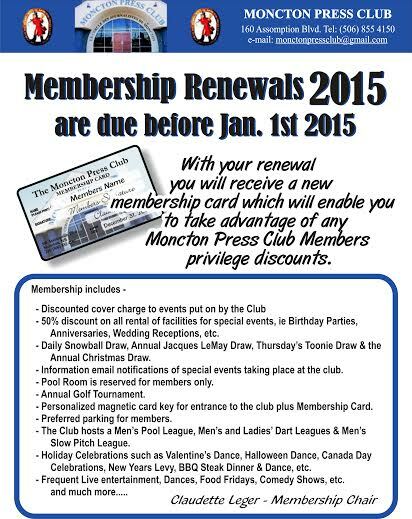 The Moncton Press Club directors and committees are working with great penchant to bring members and visitors an enjoyable and rememberable experience when attending the Club and Club functions. Of course without our members there would no reason to try so hard to maintain a great venue for sociability, entertainment and activity. Which brings me to remind all members Membership Renewals for 2015 are fast approaching. It is mid November 2014 already. Renewals are due before January 1, 2015. Get in early and get your membership renewed. Treat it as a Christmas present to yourself and possibly your spouse/partner. Where friends gather, moments shared, and friendships forged.